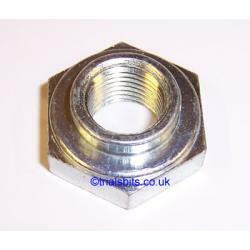 A replacement mainshaft locknut for the T20 triumph Tiger Cub. Equivalent to original part number T1348 or 57-1348. T20 Tiger Cub Swinging Arm Shim Set C15 B40 D7 etc. T20 Tiger Cub Swinging Arm Bush also fits C15 B40 etc.